Those who are set apart for spiritual leadership in the body of Christ have received a high and holy calling. They are also in for one rough ride. According to recent studies, nearly one half of all pastors have experienced depression or burnout to the extent that they needed to take a leave of absence, and 3 out of 5 are completely burned out by their 10th year of ministry. What is happening here, and what if anything can be done about it? Inspired by Jesus' life-saving invitation to his disciples in Matthew 11:28-29, Rhythms of Grace offers a cup of cold water to those spiritual leaders who find themselves wandering in the wilderness of clergy burnout. Drawing on more than 30 years of firsthand field experience in pastoral ministry, the author writes from the perspective of a compassionate friend, colleague and sacred companion. 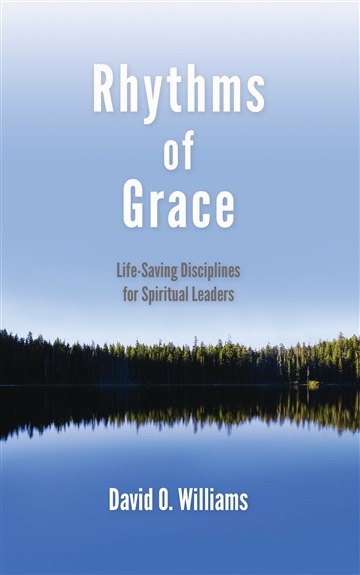 Rhythms of Grace provides a practical resource that is designed to help alleviate stress, restore hope and equip spiritual leaders to sustain healthy, effective, lifelong ministry in and through the body of Christ. "Rhythms of Grace speaks to the exhaustion and burn-out that many (if not most) spiritual leaders experience sooner or later. Williams cites his own story of trying so hard and ending up exhausted, disillusioned and isolated. Then with the Old Testament prophet Elijah as a model, enormous research on the subject and his own pastor’s heart, he takes the role of a shepherd to the wounded. He gently leads toward rest, renewal and ministry realignment. Whether prevention or cure is needed, this is a helpful book for any Christian who feels stressed, overworked or severely criticized." breathe afresh the life-giving grace of God." "Rhythms of Grace is a deeply personal and practical book. With raw honesty and humble transparency, David Williams offers realistic remedies for the deadly threats of burnout. To the weary, disillusioned and lonely, I pray that this book will encourage your soul in the profound way that it has refreshed mine." "Self-care is one of the most important, yet most neglected, aspects of a sustainable, enduring pastoral ministry. So often those who dedicate their lives shepherding others to healing and wholeness seem unsure of how to experience that same shalom in their own lives. Dave Williams' book is a spiritual roadmap for those who have lost their way. As a pastor to pastors, Dave communicates with a shepherd's heart as he guides leaders back to the Good Shepherd. Biblically-grounded, theologically astute, and enormously practical - I consider this book a must for any pastor looking to sustain or regain those unforced rhythms of grace."